The inner ear is a complex system of intercommunicating chambers and tubes called a labyrinth (lab'i-rinth). Each ear has two such regions—the osseous labyrinth and the membranous labyrinth. The osseous labyrinth is a bony canal in the temporal bone; the membranous labyrinth is a tube that lies within the osseous labyrinth and has a similar shape (fig. 12.12a). Between the osseous and membranous labyrinths is a fluid called perilymph, which cells in the wall of the bony canal secrete. Within the membranous labyrinth is a slightly different fluid called endolymph. The parts of the labyrinths include a cochlea (kok'le-ah) that functions in hearing and three semicircular canals that provide a sense of equilibrium. A bony chamber called the vestibule, located between the cochlea and the semicircular canals, houses membranous structures that serve both hearing and equilibrium. The cochlea is shaped like a snail shell, coiled around a bony core (modiolus) with a thin, bony shelf (spiral lamina) that wraps around the core like a spiral staircase (fig. 12.12b). The shelf divides the bony labyrinth of the cochlea into upper and lower compartments. The upper compartment, called the scala vestibuli, leads from the oval window to the apex of the spiral. The lower compartment, the scala tympani, extends from the apex of the cochlea to a membrane-covered opening in the wall of the inner ear called the round window. These compartments constitute the bony labyrinth of the cochlea, and they are filled with peri-lymph. At the apex of the cochlea, the fluids in the chambers are connected by a small opening (helicotrema) (figs. 12.12b and 12.13). A portion of the membranous labyrinth within the cochlea, called the cochlear duct (scala media), lies between the two bony compartments and is filled with en-dolymph. The cochlear duct ends as a closed sac at the apex of the cochlea. The duct is separated from the scala vestibuli by a vestibular membrane (Reissner's membrane) and from the scala tympani by a basilar membrane (fig. 12.13). The basilar membrane extends from the bony shelf of the cochlea and forms the floor of the cochlear duct. It contains many thousands of stiff, elastic fibers whose lengths vary, becoming progressively longer from the base of the cochlea to its apex. 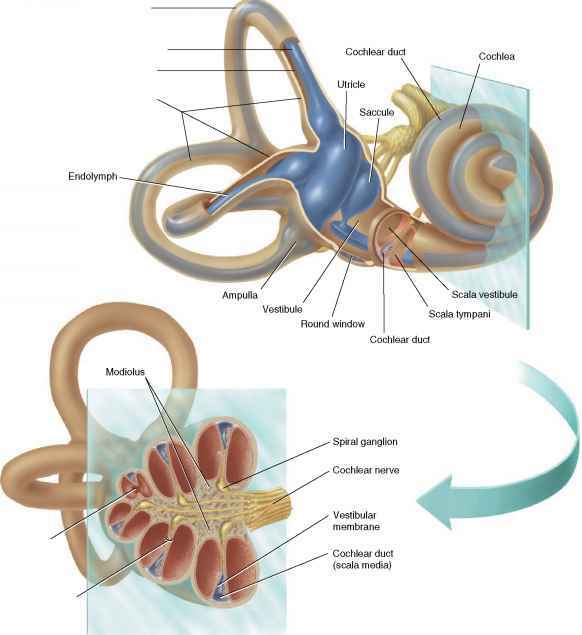 Vibrations entering the perilymph at the oval window travel along the scala vestibuli and pass through the vestibular membrane to enter the endolymph of the cochlear duct, where they move the basilar membrane. After passing through the basilar membrane, the vibrations enter the perilymph of the scala tympani, and their forces are dissipated into the air in the tympanic cavity by movement of the membrane covering the round window. Within the inner ear (a) perilymph separates the osseous labyrinth of the inner ear from the membranous labyrinth, which contains endolymph. (b) The spiral lamina coils around a bony core, the modiolus. and passes like a roof over the receptor cells, contacting the tips of their hairs (figs. 12.14 and 12.15). 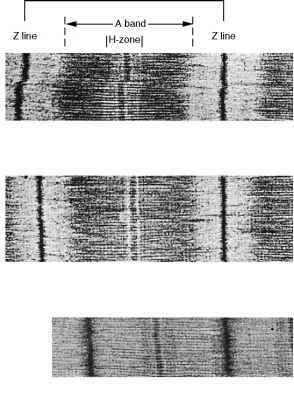 Different frequencies of vibration move different parts of the basilar membrane. A particular sound frequency causes the hairs of a specific group of receptor cells to shear back and forth against the tectorial membrane more intensely. Other frequencies deflect other sets of receptor cells. The cochlea is a coiled, bony canal with a membranous tube (labyrinth) inside. If the cochlea could be unwound, the membranous labyrinth would be seen ending as a closed sac at the apex where the bony canal makes a u-turn. Are there blood vessels in the inner ears?